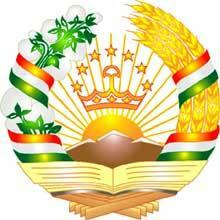 The National Emblem of the Republic of Tajikistan's represents the image of stylized crown and semicircle from seven stars on it in the beams of sun arising behind of the mountains, covered with snow and framed by wreath which is made on the right from ears of wheat and on the left from branches of a cotton. From above a wreath is interlaced by a three-striped tape and in the bottom sector there is placed a book on the support. The state flag of the Republic of Tajikistan represents a right-angled panel consisting from three colored stripes located horizontal: the top stripe - red color and equal to it on width the bottom stripe of green color, the average white stripe, making one and a half width of dense stripes. On a white stripe, at the distance of half of length of a panel from a flagstaff, there is a stylized gold crown and a semicircle from seven stars above it. The attitude of the general width of a flag to length is 1:2. The crown and a star are entered in a rectangle, the sides of which on a vertical make 0,8 and across 1,0 width of a white stripe. Five-pointed stars are entered in a circle with diameter 0,15 and settle down on an arch radius of 0,5 width of a white stripe. There are three colors on a flag of the Republic of Tajikistan: green, red and white. A green stripe are valleys, they are not enough in republic - 7 % of territory. Because the rest of the territory is occupied by mountains. The white stripe is a color of the main richness of republic - cotton and also the color of snow and ice in high mountains. The red color is a color of unification of republic and brotherhood with other nations of the world.